Everyone loves a chance to win something free! In online advertising, prizes, giveaways and competitions are great ways to drive people to take note of your products. It is crucial to be honest and deal with your customers fairly to avoid a serious offense. You must keep your promise and abide by the terms of your offer. 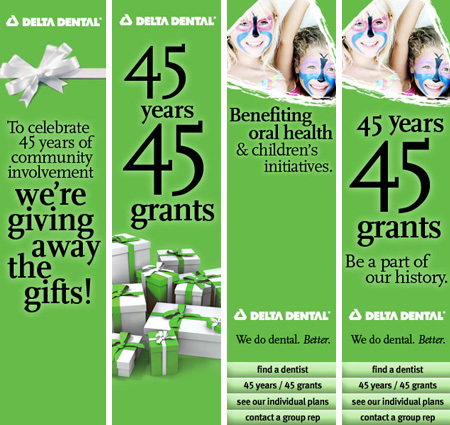 Ncutt designed Delta Dental’s most popular and effective internet ad campaign during their 45th year anniversary. Delta Dental offered 45 grants to individuals with the best plan to promote health initiatives for children. The banner ads linked interested patrons to the site which led them through the submission process. 45 contestants were granted the funds for their plans. The amount of entries and re-tweets were much greater than the client expected from their online advertising campaign.